This is quite tall, the slender, rather weak stems being sometimes over a foot high, with smooth leaves, often with some hairs on the veins of the under side. The flowers, over half an inch across, with a short petal-spur, are almost white, delicately veined with purple, yellow in the throat and tinged with violet or purple on the outside. Occasionally they are pure-white all over and sometimes sweet-scented. The capsule is oval and smooth. This is common in eastern mountain woods, and to eastern eyes looked far from home when we found it in Walnut Canyon in Arizona. CanadaViolet-Viola Canadensis. 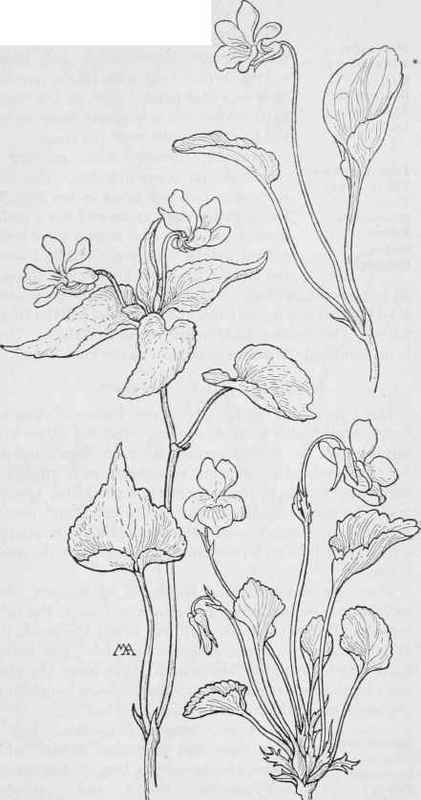 Pale Mountain Violet-V.adunca. van glabra. LOASA FAMILY. Loasaceae.